Islanders showed no mercy to depleted opponents as they racked up a monster success last Saturday. The city’s second team crushed League South Two (East) rivals Lee Valley Lions – who arrived at Planet Ice with only 10 skaters and one netminder – 16-0. 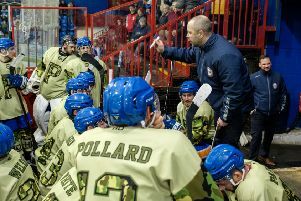 Hot prospect Brad Moore and captain Shaun Yardley did most damage with six points apiece – three goals and three assists in Moore’s case while the skipper struck twice and had a hand in four other goals. There were also double-strikes from Clint Herring, Nathan Pollard, Billy Porter and James Pentecost (who also supplied three assists). Josh Turley, Kenny Bavin and Connor Hunter completed the scoring on a night when bewildered Lee Valley goalie James Tipple faced a staggering 96 shots. Five of the goals arrived in the opening session, six in the second period and another five in closing stanza while there was a shut-out for Islanders even though they had to deploy Leon Groom – better known as a bruising forward – between the pipes for the final period after netminder Dan Lane had departed for Sheffield to act as back-up for Phantoms. Islanders are now out of action until November 8 when they travel to Lee Valley for the first of four successive away games.